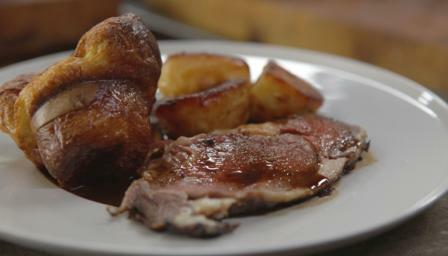 James Martin’s gorgeous roast beef recipe with homemade mustard takes Sunday lunch to another level. For the bourbon mustard, place the mustard seeds, sugar, honey and 3 tablespoons water in a saucepan. Stir well and bring to a gentle simmer. Remove the pan from the heat and add the vinegar, stirring to combine. Transfer the mixture to a large bowl, cover with cling film, then set aside for at least 4 hours, or overnight. During this time, the mustard seeds will absorb all the liquid. Transfer the mustard seeds to a food processor, add the bourbon and blend to a creamy but still slightly grainy mustard. Season, to taste, with salt and freshly ground black pepper. Chill in the fridge until needed. For the Yorkshire puddings, sift the flour into a bowl and season with salt and freshly ground black pepper. Add the eggs and whisk to a smooth batter using an electric whisk. Pour in the milk and whisk again until smooth, then cover and chill in the fridge for at least one hour, but preferably overnight. For the beef, preheat the oven to 200C/180C Fan/Gas 6. Season the fore-rib of beef with plenty of freshly ground black pepper. Heat a splash of oil in a large frying pan over a very high heat. Add the fore-rib of beef and fry for 2-3 minutes on all sides, or until browned all over. Transfer the beef to a roasting tray, then spread some of the mustard all over it. Season, to taste, with salt. Roast in the oven for 1½ hours (for medium), or until cooked to your liking. Meanwhile, for the roast potatoes, bring the potatoes to the boil in a large pan of salted water, then boil for one minute. Drain well, shaking the drained potatoes so that the edges rough up a little. Heat the lard, beef dripping or vegetable oil in a deep-sided, heavy-based roasting tray over a medium heat. When the fat is hot, add the drained potatoes and fry for 2-3 minutes, turning regularly, until golden-brown on all sides. Season, to taste, with salt. Half an hour before the beef is cooked, start roasting the potatoes. When the beef is cooked to your liking, remove it from its roasting tray. Reserve the roasting tray and the juices it contains. Transfer the beef to a warm plate and cover with aluminium foil. Set aside to rest for 30 minutes. Meanwhile, turn the potatoes, increase the oven temperature to 220C/200C Fan/Gas 7 and continue to roast for a further 20-30 minutes, or until crisp and golden-brown. Heat the roasting tray used to cook the beef over a medium heat until the meat juices are bubbling. Pour in the stock and bring to the boil, then reduce the heat until the stock is simmering. Simmer, scraping up any burned bits from the bottom of the roasting tray using a wooden spoon, until the volume of liquid has reduced by half (about 6-8 minutes) to form a thick gravy. Season, to taste, with salt and freshly ground black pepper. To cook the Yorkshire puddings, divide the dripping or lard among the holes of two 12-hole muffin trays. Place the trays in the oven for 10 minutes, or until the fat is smoking hot. Meanwhile, whisk the Yorkshire pudding batter. Carefully pour the batter into the holes of the muffin trays, filling each hole two-thirds full. Cook the Yorkshire puddings in the oven for 20 minutes. Do not open the oven door during cooking. After 20 minutes, open the oven door to allow any steam to escape, then reduce the oven temperature to 190C/170C Fan/Gas 5. Cook the Yorkshire puddings for a further 12-15 minutes, or until risen and golden-brown. To serve, bring the beef to the table and carve onto serving plates. Drizzle each portion of beef with some of the gravy and place an extra dollop of the mustard alongside. Serve the roast potatoes, Yorkshire puddings and steamed vegetables in large bowls for everyone to help themselves. If you don’t fancy bourbon you could make the mustard with a different spirit or even use beer or orange juice.